Since 1997, the United States has gone from around 50,000 cell towers to over 500,000 and counting. In my opinion, the ever-expanding deployment of wireless technology represents one of the greatest threats to human health – along with GMOs in our food supply and the geoengineering (chemtrail spraying) of the planet. Of course, the wireless industry says ‘no worry.’ So, why are they making cell towers look like a church cross; cactus in the desert; barn silo or a tree in the park? What are they trying to hide? When it comes to radiation exposure – is ignorance bliss? The slogan of Stealth Concealment Solutions, Inc., a South Carolina company says it all: ”Our Success is Invisible”. They go on to say, “Imagine running a business whose success relies on being completely undetectable to the public. Ours does.” They obviously pride themselves on hiding wireless, radiation-emitting, devices from the public. In 1992, a BP sign at a local gas station in Atlanta became the first stealth cell phone tower in the nation. Over the years designs have expanded and gotten much more ‘creative’. The First Presbyterian Church in Des Moines is working with Verizon to construct a tower that will be dressed up as an 11-story cross. The deal, which is being reviewed by a city zoning board, includes annual compensation to the church. Let’s face it, cell phone towers are scientifically experimental technology. To date, there have been no long-term studies done on the effects of cell tower radiation exposure on humans, animals or plant life. However, we are beginning to get an idea of the damage done to humans. According to the Mount Shasta Bioregional Ecology Center in California, studies show than even at low levels there is evidence of DNA damage. On an epidemiology level, we see a link with cell towers to brain tumors, cancer, suppressed immunity, depression, miscarriage, Alzheimer’s disease plus many other chronic health problems. In May 2011, the World Health Organization classified radio frequency electromagnetic fields (inclusive of cell towers) possibly carcinogenic to humans based upon studies showing an increased risk of lethal brain cancer associated with wireless phone use. If you have any doubt – about the dangers of microwave radiation from cell towers – I strongly suggest you look into the work of Dr. Barrie Trower, a British physicist who was a microwave weapons expert and worked for the Royal Navy and the British Secret Service. According to Dr. W. Lšscher of the Institute of Pharmacology, Toxicology and Pharmacy of the Veterinary School of Hanover in Germany, dairy cows that were kept in close proximity to cell phone towers for two years had a reduction in milk production along with increased health problems and behavioral abnormalities. The most powerful cell towers are placed on mountains and hilltops outside urban areas. Studies of people and animals in the area show all kinds of stress reactions including sleep disorders, birth defects, cancer and Alzheimer’s. Many European countries already set radiation exposure limits much lower than the Federal Communications Commission (FCC) allows. The FCC only considers the ‘heating effect’ of wireless technology – yet many independent scientists warn that wireless (microwave) radiation has a ‘biological effect’ – at much lower levels than required to heat the body. Can we afford this human experiment? 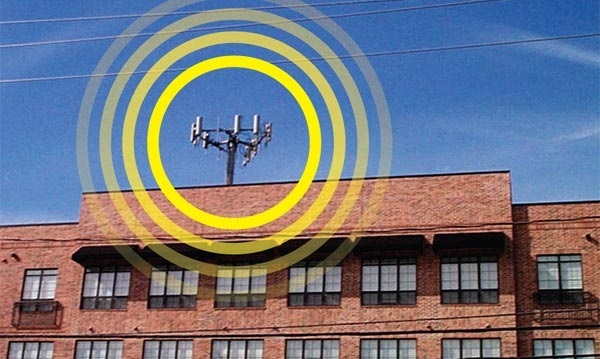 No one really knows what happens when populated areas are surrounded by cell towers for years and years. But, many cancer experts suggest that it takes 10 or more years to develop an ‘official’ cancer diagnosis and microwave radiation increases our risk of cancer. Clearly, with wireless technology, we are being exposed to millions of times more radiation than any other generation before us. The question is: what price will we pay for modern technology? When you find out where the towers are it’s up to you to find out the EMF readings in your home. To get reliable readings you can call a qualified EMF consultant, who will come to your house or you can purchase an EMF meter. Owning a meter is a good idea since EMFs change often – depending on where you travel. And, it’s not too expensive to purchase your own meter. I, personally use a Cornet ED78S RF/LF. Make sure your bed and couches are not near a wall where the readings are high. If you have land and own a home planting trees between your house and the cell tower will offer some protection. Trees help absorb radiation. Use radiation-blocking paint or wall-covering or other shielding devices if the readings are high. Keep in mind, windows are usually the most vulnerable spots in your home. So, there is a special window film that comes in a roll from Scotchtint – which you can use to minimize your exposure to EMF pollution. If you want to learn more about how to create a healthy home environment – visit: The International Institute of Building Biology and Ecology for more information. Ultimately, to minimize the expansion of cell towers in your area, you will need to get socially/politically active to educate the public about the dangers – especially local politicians. Let them know that cell towers are not welcome in your area and be sure to watch the film, Take Back Your Power. One of the worst places these transmitters are mounted is school athletic stadiums with light towers. EMF radiation is especially harmful to developing brains. These kids spend 6-8 hours a day absorbing EMF radiation. Spectators get a couple hours every time there is an athletic event.